Take on every challenge in the TYR Women's Solid Crosscut Tieback Top . Designed for today's athlete, the BTSOD7A boasts a 100% polyester construction, making it nearly 20 times stronger than traditional swimwear. So, whether your training takes you to the pool or the beach, you can be sure TYR's Durafast One® fabrication will provide both a secure fit and fade-free color. 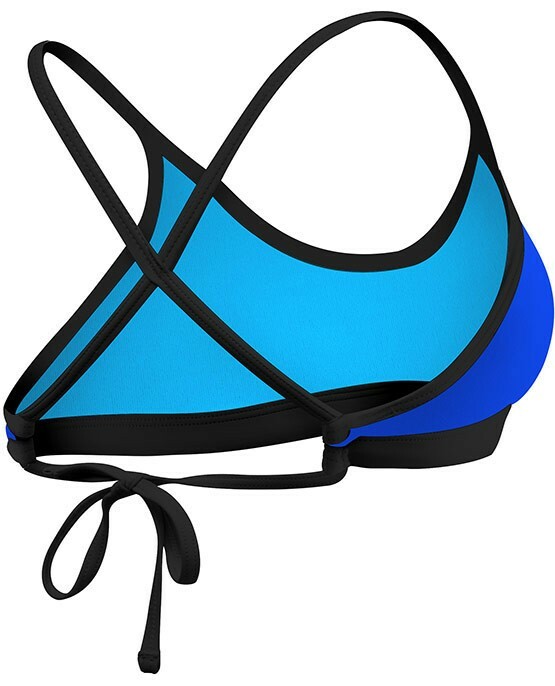 Featuring a low neckline, sleek/flexible straps and X-back, the adjustable Crosscut tieback top is ideal for athletes who want minimal coverage during every swim. I got this suit to use for lap swimming in my training. Its super comfortable and feels great in the water. Highly recommend! Also love the tie string for the bottom. Great fit that allows you to be active without worrying. Love the back of the suit it allows you to adjust it which is great for swim meets if you want to pull your technical swimsuit off your shoulders. Not much coverage in the back but at the same time itâ€™s just the right amount of coverage. Q: Are there bottoms to go with this top? A: Thank you for contacting TYR Sport! We are always eager to answer any questions you have about our products. We make a variety of bottoms to mix and match. Take on every challenge in the TYR Women's Solid Crosscut Tieback Top. Designed for today's athlete using Durafast One® technology, it boasts a 100% polyester construction, making it nearly 20 times stronger than traditional swimwear.